It was another warm, sunny day at Camp. This allowed for a full morning of volleyball, canoe, cricket, archery and more. But the highlight of the day today was the Les/Jolis Triathlon. Campers competed for Les/Jolis points. 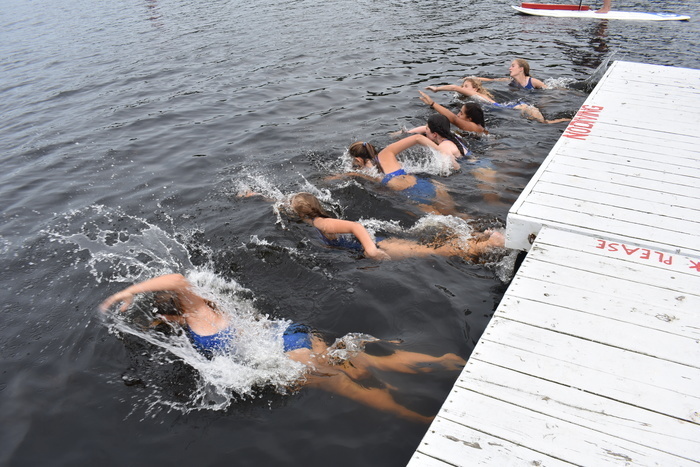 The competition consisted of a swim to Fran’s dock and back, a run to the bridge and back, and physical exercises across the field to the finish line in front of the Hearth. The winner of the competition…Mary. Points for the Les Pucelles! Not sure what was more exciting, the triathlon or dinner. On the menu for tonight…wait for it…Chicken Patties! The meal the girls sing about in the Hearth. This was followed by brownies. For evening activities, the girls learned a new dance that will be performed for our visitors on Visiting Day. Of course we ended the evening with campfire. The counselors conducted campfire and taught the campers the Banquet song from 2014, Adventure is Right Here. What a beautiful song. Another exciting day at camp!